1) Cover Sheet – Just a nice little welcome and an explanation of who you are, ex. listing your name/website, for future reference. I put a picture of my blog button so they might be familiar with my blog when they went there. 2) Coupon Lingo – I wrote up an extensive list HERE and shared it with them. I did not go over it in the class but did explain it was in there in case they needed to refer to it while I was talking. I made sure to explain what a catalina, Register Reward and ECB was right away, though. 3) Where To Find Coupons – This is so important for new couponers. They usually have no idea where to start. This will give them a few ideas of where to look for coupons. I have a list HERE you can use. 4) How To Organize Coupons – Now they’ve found their coupons, help them organize them. I wrote the top 3 ways HERE. Visual aids are so useful in this part. You can use an inexpensive shoe box w/ lid from say Target for $1.99 for the coupon box. I happened to have a zippered binder from when I tried that method so I could show them. And the coupon insert method is just an expanding file you can get for $3-5. I got a cute designer one at Target for $5. And the little ones are around $3 at Target. I actually bought an extra for a giveaway. If you wanted to have fun, you could fill an organizer with inserts for a giveaway! 5) Walgreens 101, CVS 101 & Stacking Coupons – Now that their coupons are all organized, teach them how to use them with deals and sales to make the most of those coupons. I wrote this info up HERE. I also did a quick walk-through on Jewel, since that’s where most of our area shops. I talked about how you can use coupons with the “Spend 25, Get $10” to make great deals and how sometimes the $25 you need to spend is pre-sale prices and not on the sale prices. This segment is by far the most important one to have visual aids for. In my write-up I gave examples of toothpaste, soap, etc. and I actually brought some with to hold up with a coupon while I explained the steps. I’d highly recommend bringing a Register Reward, CVS Extra Care Buck, Catalinas and Store Coupons to show examples of. Find an example of a Store and Manufacturer’s coupon that they could stack. It really does make it easier. If you really want to help, bring the latest sales ad and show them a few deals they could get that week. 7) Resources – This was the last page in my packet. It listed several websites/blogs that I recommended in helping them find deals & coupons. This is a personal preference of your own favorites. Overall, the best advice I can give you is to just be yourself. While speaking in public can be a very nervous experience, you will find partway through just how easy it is to speak about couponing, if it’s already something you are pretty good at now. I had so much fun at mine that I completely forgot I was talking in front of people. When mine was over, I handed out a bunch of freebies I collected. These were just things I picked up for free or cheap with my coupons. In the end, your class shouldn’t break your wallet. So if you wanted to do one for FREE, keep that in mind. I was lucky enough that since I did mine for free, the library made the photocopies for me. They also picked up cookies, water and $1 coupon organizers for everyone from Michael’s. (You could make your own cookies and watch for a good deal on water/coffee.) I picked up pens for FREE at Staples. I already had my visual aids. I did do two giveaways, along with the freebies. Overall, I really didn’t spend a lot. I just gave of my time and knowledge. My class ran about 1.5 hours and then we chatted for awhile afterwards, so I’d figure about two hours. Good luck to all of you! If you have any questions, please do not hesitate to email me at coupongeek at live dot com. I should have some free time tomorrow to answer them and I am also going to email the Word Document I used to those of you that requested it. Thanks for being so patient with me while I put this posting together! I had to get a few postings up for the references. UPDATE: Yes, by all means, if any of you just reading this would like the Word Document I used, I would be more than glad to email it to you, too! 🙂 Just leave a comment on this posting and I’ll send it to you. 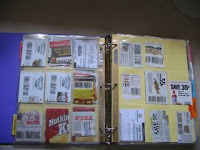 1) Coupon Binder – This is some form of zippered/closed binder that they put “baseball card sleeves” in to hold the coupons. The coupons are “clipped” and folded into the slots of the sleeves so that you can just flip through your coupons page by page. To see how to organize one, Super Jenn has a posting HERE. 2) Coupon Box – This is some form of box where the “clipped” coupons are usually kept in some type of labeled envelope system. If you go with this method, I’d highly advise a box with a secure lid! Usually, when they shop, the box is put in the child seat of the cart for easy access. 3) Coupon Insert Method – This is where the coupon inserts from the Sunday paper are kept intact, and either not clipped or partially clipped, and filed by week. Usually an expandable file folder that has tabs for labeling is used. Typically blogs will list where you can find the coupon needed for a deal. They say something like, “Use the $1/1 from the 7/12 Smart Source.” I’ll then go to the 7/12Smart Source insert, find the coupon and clip it. It saves me from having to clip out all those coupons, but I still have them handy in case I can get a good deal on something. The disadvantage to this method is that you don’t have all your coupons with you when you shop. But I look at it this way, while I may miss out on a clearanced item or two; it also prevents me from “impulse shopping” and buying something that’s not on my list. I can always jot down the deal and take a chance at picking it up later in the week if I’m out again. Now, if you make up your shopping list and you are buying, say Skippy Peanut Butter and Hunt’s Ketchup, you can go to one of the coupon databases out there and see if a coupon exists for those products. My favorite one to use is Coupon Mom. You’ll need to register, but it’s free and easy to use. Just sign-in, choose grocery coupon database and then your state. I always sort it alphabetically. For these items, I’d look for Skippy and Hunt’s. If they are listed, you’ll need to see what insert they are in. For example, the Skippy Peanut Butter says 6/14SS, I’d then go hunt down my Smart Source insert from 6/14 and clip it. Like I said, there’s no one right way to organize coupons. You may even switch over time. I’ve tried all of them! Personally, I hate cutting out coupons and I have little spare time, so that’s why I stick with the coupon insert method now. Always keep in mind; coupons are “regional,” meaning some areas/states get some we don’t. So you may see some listed on blogs that aren’t going to be in your inserts. When I posted HERE that I had just done my first coupon class, I received quite a few emails/comments asking either for the materials I used or for ideas on what to cover in the class. For those of you that commented/emailed, I would be more than happy to send what I used. They are far from perfect but at least they are a starting point for you. I will also be doing a posting next week sometime on how to do a class of your own. Like I said, I am no expert in this subject but at least it will help you start off and you should be able to at least teach the basics that will help them find the deals and save on their grocery/household budget. This blog was created to help as many people as possible to save money in as many ways as possible; couponing, budgeting, changing life habits, etc. So I am more than thrilled to help anyone that would love to teach these same things to people within their communities. So stay tuned. I’ll try to get the posting up late next week. Pinecone Research: Taking New Panelists! Engineer a Debt Free Life has details HERE on how you can sign-up to get into the Pinecone Research Survey Panel. It’s a tough one to get into, with limited sign-ups, from what I hear, so sign-up before they quit taking them again! You get $3 for each survey you complete, which can add up over time! They already quit taking sign-ups but EADFL does have other survey opportunities for those of you looking for them. Use the same link above. 1) Sunday Newspapers – These are the biggest sources of coupons. To find additional copies, check recycling bins or ask your family/friends if they are using theirs. There are anywhere from none to three inserts per paper. For a preview of upcoming coupons, you can check Sunday Coupon Preview. 2) Mail – You can sign-up for coupons from Red Plum here. You can also check out their printable coupons, too. 4) In-Store – You can often find coupons called “blinkies,” which are the little machines that spit out coupons by the products they are for. There are also “tear-pads,”as well. You can sometimes even find “peelies” right on the products themselves. 5) Printable Sites – Some of the big printable sites are Coupons.com, RedPlum, Coupon Network and Smart Source. These coupons rotate week after week and usually have maximum printings that when the limit is reached, they are pulled off the site. So if you see one you think you might need, you should print it. (You can usually print two per computer.) Other sites are for eCoupons are Saving Star and Cellfire. 6) Blogs – Blogs are a great place to find coupons. I stumble upon several at my fellow blogger’s sites throughout the week. I compile them throughout the week and post them on Mondays. 7) Search Engines – If you are looking for a specific coupon, just type the brand name followed by the word coupon and you might be able to find one that way. 9) Manufacturers Websites – More and more manufacturers are hosting coupons on their own sites now. If you use a lot of a particular item/brand, check their website to see if they offer coupons. If they don’t, email/mail them and request some. 10) Magazines – By far, the magazine with the most coupons lately has been All You magazine, which you can only get by subscription or at Wal-Mart. The price of the magazine is well worth the coupons inside. Make sure you check your magazines to see if there are some inside. 12) Forums – There are several great forums out there to check into. The top ones I’ve found are WeUseCoupons, HotCouponWorld and AFullCup. You have to register at each of them, but it’s free. 13) Store Websites – Make sure you sign-up for your local store’s loyalty programs and register at their websites so you can get emailed coupons. You can add eCoupons to your card through Saving Star and Cellfire. 14) Phone Book – Don’t forget to check your phone book for coupons for your local area businesses. 15) Entertainment Books – The Entertainment books have coupons for restaurants, entertainment, retail stores, etc.